If you’re a unique and glamorous bride, the pear diamond engagement ring is the perfect choice for you. Also known as a teardrop diamond for its distinctive shape, the pear diamond is a beautiful feminine and vintage-inspired cut. With one rounded side and one tapered side, the cut is a combination of the round brilliant and the marquise cut diamond. The only drawback to pear diamonds is that they range on the pricier side, but if you’re willing to invest, they can be a timeless piece of jewelry. With its 58 facets, the pear shape is more complicated than simpler cuts like the emerald and therefore doesn’t require the same level of clarity. Its long and tapered shape has a slimming effect on your fingers. 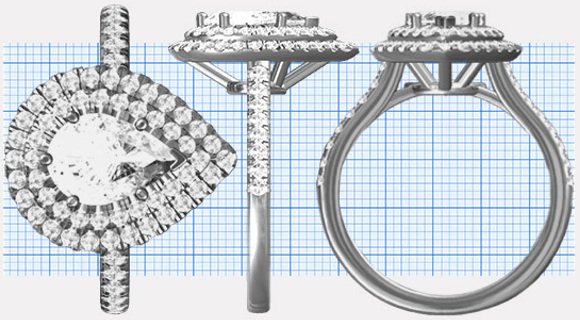 Since they are less popular than other shapes, you’re guaranteed to have a unique and special ring. The pear shape lends itself well to a diversity of settings and side stones. The distinctive shape of the pear diamond means that you must pay extra close attention to issues of cut, shape ratios, and color. The point of the pear diamond has a tendency to appear darker, so selecting a stone with excellent color ratings is key to ensure your ring is as beautiful as it can be. Be aware that the pear shape is prone to two issues: the “bow-tie” effect and “high” or “uneven” shoulders. The bow-tie effect is when the stone possesses an obvious dark spot that resembles a bow tie because of its cut and the shadows the light casts. 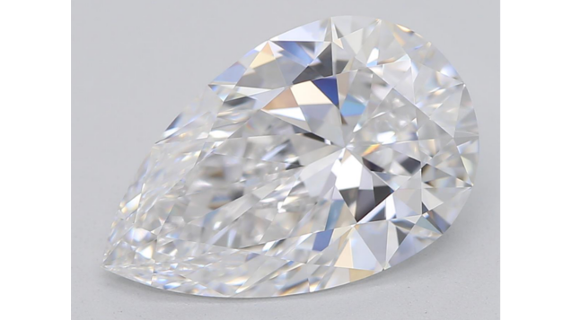 If the non-pointed end of the pear diamond doesn’t have a round soft arc, it is likely that it has high or uneven shoulders, which can make the stone more vulnerable to chipping and reduces its value. Be on the lookout for symmetry when evaluating your pear diamond -- the point of the stone should be exactly opposite the highest point of the curved end and the sides should curve identically towards the point. However, while the length-to-width ratio is often an important factor in the value of other cuts, the pear diamond has more flexibility and comes down to personal preference. Indeed, many opt for a longer diamond to enhance the lengthening effect inherent to the pear shape. The flat surface of the stone, known as the table, should comprise at least 51% of the stone’s girth. The depth or height of the stone when viewed from the side should be at least 53% of its width or more -- the ideal stones have a depth that is 58% of the width or more. The “culet” (sharp underside of the diamond) should come to as small and sharp a point as possible. While there are technically no rules to how best to wear a pear diamond, there are some tips and tricks to maximize the beauty of your ring. Whatever diamond pear setting you choose, it is safest to opt for one with 6 prongs (or a halo or bezel setting) to help protect your stone’s vulnerability to chipping. This would mean two prongs on each side of the stone, with one prong on each end of it. No matter what make sure you are protecting the stone’s pointed end, which is it's most vulnerable area. Traditionally, people opt to wear the pointed end of the stone facing their hand because it helps protect the pointed end of the stone and reduces the likelihood that it will catch or snag on clothes or surfaces. However, many wear the stone with the point facing their finger because that enhances the cut’s natural lengthening and slimming effect. There are many beautiful settings that look stunning with a pear diamond. 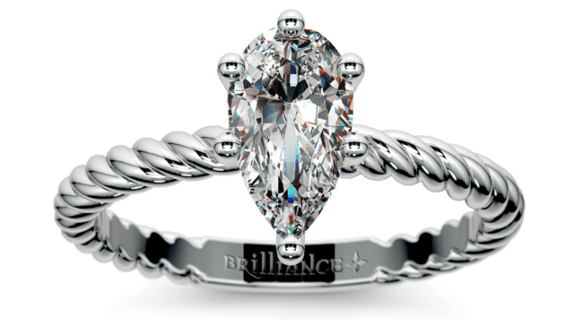 One of the most popular is a simple solitaire setting that allows the unique shape of the stone to shine. This can be enhanced by selecting a pave band or something a bit more chic like rose gold. The other most popular setting for pear diamond rings is a halo setting, which protects the central stone, enhances its shape, and adds some extra bling. The pear cut also looks gorgeous with side stones, as Elizabeth Taylor famously did with her Taylor-Burton diamond. Finally, if you really want to shake it up, consider an east-west setting for your pear diamond instead of the traditional vertical display. It will truly make you a unique and special bride. If you keep all of these tips in mind, you’ll have a picture perfect pear diamond engagement ring.